Find out below why I switched to Paleo Protein Superfoods! Products are all free of artificial ingredients, GMO's, coloring, gluten, dairy, soy, and are organic. Delicious post-workout nutrition that promotes the growth of lean muscle mass and overall health. Let's start off with this basic question. Why do I need a protein supplement? You don't HAVE to have one to get in shape. But many lifters, runners, yogis, and health nuts sip down their protein shake daily. Why? Because it is hard work to get in all the protein you need in a day. I already eat 1-3 eggs, beef, chicken and sometimes pork daily. To hit my protein goal, I really need a quick and convenient way to ht those grams of protein for weight loss and muscle gains! Not to mention it is helpful to get your protein in liquid form post workout. This helps the body quickly utilize the nutrition instead of focusing on digestion. Okay so we need a protein supplement. But the question I get a lot is which one? I’m so glad I came across Rootz Superfood! These clean, whole food based energy and protein supplements, and wanted to share this with you because I think you will love them also. 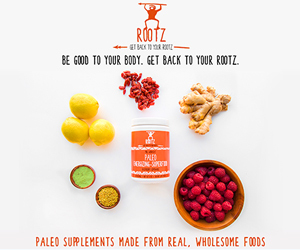 Rootz Nutrition is a recently launched company that offers a Paleo-approved energizing powder and a complete protein+superfood+greens powder made from real, wholesome foods. All of our products are free of artificial ingredients, GMO's, coloring, gluten, dairy, soy, and are organic. We strongly believe that what is left out of a product is just as important as what goes in. Well many reasons actually. First off, it is so hard,, almost impossible to find protein powder out there with reliable ingredients. Everyone drinks whey protein, specially to help gain muscle. Well did you know if you just buy any ol whey protein powder you are ingesting so many hormones? Whey is derived from milk, which comes from a cow. Unless you buy hormone free, grass fed whey protein, It contains so many added hormones, that were fed to the cows, that is full of estrogen. Now aren't you trying to gain muscle which increases your testoerone? Now that you just finished a workout, your testoerone levels are boosted you down a protein shake full of estrogen causing hormones, I think this is really counterproductive! Don't you think? If you are like my husband or I, you just can't handle the fake, artificial sugars they load protein shakes on the market with. I'm trying to be healthy and keep processed foods out of my diet, so those ingredient were off limits. I mean, they cause brain fog, bloating, stomach aches, head aches and cravings. Also, a lot of us can't handle to much milk in our diets. If your like me it will give you a tummy ache in a matter of minutes. So I started to look for vegan powders. I have tried MANY! Quiet a few of them I had to pitch. I found some that were pretty good, to my standards. I let my Dad give them a try and his response was "it tasted like play-doe." Another issue I had, besides being intolerant to milk, was bloating from vegan protein sources. Ya, I have found a few that I can handle but I still have to be cautious to not over do it. I just always wished there was another alterative. So I was left with virtually no other options protein supplementation. I Knew that most of the products on the market were loaded with chemicals and artificial ingredients, often times dangerous, and almost always doing more harm to a person's body than good. I wanted something that was made from real food ingredients that I could actually pronounce, but would still give me results. To my frustration, most products I had tried left me disappointed. So I decided to take the plunge and try rootz!! The company also has a Paleo Energizing Superfood supplement. Now, my go to prework is coffee. It's natural, taste delicious and is warm so it gets me moving. I am looking forward to adding this new energizer into my diet. I think it will be good to keep in my gym bag when I'm on the go. And sounds more refreshing for hot days and outside workouts. It doesn't matter if you are a professional athlete who trains for hours every day or a soccer mom who is looking for convenient, healthy on the go food options-- If you are looking to eat healthier and have more energy, I think you will love Rootz. If you’d like, you can check out their products for 10% off, by entering the discount code THEFITMOM at checkout! How to calculate how many calories you need to eat.